You will appreciate how quick and easy it is to adjust and set the pins for precise and accurate shots. 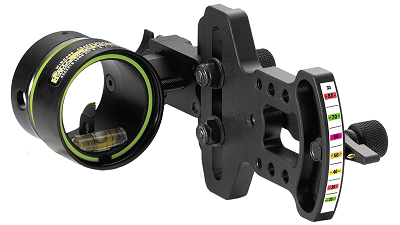 This bow sight is designed for durability, and it can also be used in low light settings. It comes with a sturdy construction that is easy to install, and can be mounted on almost any compound bow. While this sight is easy to adjust it should be noted that it must be done manually anytime the yardage changes, which might not be ideal when you only have seconds to make an accurate shot. This bow sight is designed specially with hunters needs in mind. HHA understands that you don’t have time in the field to make complicated adjustments which is why the designed this one pin sight to be easy to line up with your target. You don’t need tools to make precise adjustments, and you will appreciate how easy it is to dial in the required yardage. Once the sight is set for 20 and 60 yards, you can automatically make accurate shots up to 80 yards. The yardage is increased in 5 yard increments so you can easily hit almost any target regardless of the distance -depending on your skills of course. The black color looks great on any bow, and it also lets the sight blend easily into your surroundings. The fiber optics are protected from the elements with a convenient hood, and this also allows you to use the sight in low light settings. This is ideal for stalking prey at dawn or dusk, when game animals are usually the most active. The fiber cable also measures 5 feet in length so your movements are not hampered by the sight. You will also appreciate the rheostat light which allows you to adjust the brightness of the pin. Whether you are target shooting or hunting you want a sight that can withstand almost any weather condition. This lightweight sight is designed to be durable, and last through the rigors associated with use outdoors. You will also appreciate how easy the sight is to mount on almost any compound bow, and how simple it is to adjust to ensure that it is installed evenly. If you are looking for a one pin sight that is capable of providing you with accuracy, this might be exactly what you are looking for. The included yardage sticker makes it easy to adjust, and you only need to set the sight for 20 and 40 yards and it will automatically be accurate for shots up to 80 yards. It can give new archers the confidence they need to try and make long distance shots, and it can even improve the accuracy of experienced hunters. The fiber optics allow you to safely hunt in low light settings, which is always an advantage. You will also appreciate how easy it is to install, and mount evenly. With its affordable price and dependability, it is easy to see why this bow sight it is popular choice with novice and experienced hunters and why it is considered as one of the best single pin bow sights on the market.